Extraction of core semantic concepts and relations, that is Entities and Relations from unstructured text. Mapping these Entities and Relations into (Knowledge) Graph representations. Analyzing hidden properties and relations using formal analyses of Implicatures and Presuppositions. John Smith sold Grungle Inc. He bought Sproke LLC. Sproke LLC likes him. He likes apples. 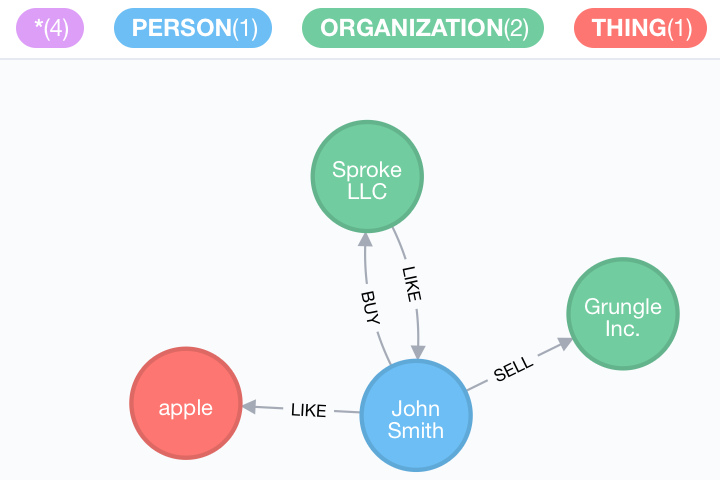 In fact, my current OpenIE system parses the sentences and renders this representation in Neo4J. Identifying the most specific semantic type of every entity using general knowledge graphs, ontologies, or other forms of encoded world knowledge. In the graph above, what we want to achieve is a more detailed typing of the organisations Grungle Inc. and Sproke LLC, as well as a more detailed specification of apple not as a THING, but as a FRUIT. I use embeddings and vector models to identify the most specific hypernym for a concept in knowledge graphs like YAGO or DBpedia. Expanding the knowledge or concept graph using the analysis of implicatures and presuppositions for every utterance or sentence. Implicatures, for example, could be resulting from conversations, as for example, when in a conversation speaker A says to speaker B: "I bought the black dress. ", we might immediately conclude that A and B already talked about the event of buyin a dress earlier, in fact, about the one black dress. We know this, because speaker A used a definite article with the direct object. We also know that speaker A had more than one dress to chose from and that none of the other dresses is black. We can derive this from the specificity properties of the direct object noun phrase. Presupposition would be all the relevant facts or propositions that should be true, if a particular utterance or sentence should be assumed to be true. For example, if some speaker A says: "Susan is walking her dog. ", we can conclude various other facts that need to be true, for example: "Susan owns or possesses a dog. ", "Susan walks at the time of the utterance. ", "Susan's dog walks at the time of the utterance. ", and so on. We can compute and represent for further analysis and study the presuppositions as additional concept relations together with the extracted ones. Analyzing the temporal logic and sequence of events, and causalities. This has to do with analyzing the tense of a sentence or clause, and its scope over other clauses and predicative relations. For example, in a sentence like "John said that Peter bought a new car." the two events are ordered in time, that is "John say X" is preceded by "Peter buy car". This is not true in a sentence like "John said that Peter will buy a new car.". The goal is to order all relevant events extracted from unstructured text along the time axis and provide a flow-analysis of the event sequence. Analyzing Implicatures and Presuppositions, the semantics and pragmatics of text, requires not only modeling of general and universal linguistic properties, but also domain specific knowledge. To analyze very specific semantic properties in the medical domain, for example, I utilize knowledge representations and ontologies from these specific domains. One example could be that we could conclude that person A has headache or uses blood thinners for some reason, if she says or writes that the price for Aspirin went up. Such implicatures are generated by looking up properties of specific medicine or chemicals from domain specific ontologies, taxonomies, or knowledge representations. This kind of OpenIE requires much more sophisticated NLP components than common free tools and pipelines provide. The experiments involve processing of business, legal, or medical documents, as well as news articles. My current experimental environment consists of microservices based on C++, Java, Go, and Python components coupled in an RPC-based and RESTful architecture. Given suggestions, advice and initial experiments, I am working towards a more homogeneous environment, mostly based on Java 10 based services and a RESTful architecture. If you are interested in working on such an OpenIE and Graph-based system and join my research group, contact me please. There are various GitHub repositories that I maintain with material and code that explain the project. See for more details my GitHub and Bitbucket pages.